This backpack holds up to 12 spray paint cans. It features heavy-duty external zippers to accommodate the weight of the spray cans, rugged adjustable straps designed to sit comfortably on the back, with an integrated handle attached for maximum carrying flexibility. The main compartment allows the flap to hinge open 180 degrees for easy access. It can also be worn on artist's chest with the main compartment open, allowing immediate visibility and accessibility to cans while at work. 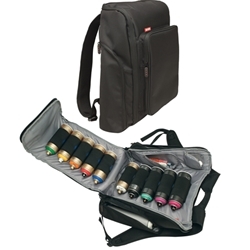 The main compartment holds 10 standard sized spray cans with internal zipper pockets to hold additional spray nozzles, markers, pens or tools, and two outside zippered pockets hold one tall can each, and the front outer pocket holds up to a 9" x 12" sketchbook. Its durable elastic can holders use patent-pending magnets to silence metal can agitators. Made with luggage-grade nylon construction for durability and all-weather protection with breathable athletic back padding.